Getting into acting school is a goal for many young actors. When I was leaving high school, auditioning and getting a place in a major drama school was my only ambition. I was obsessed. It took me three years to get accepted into acting school. I ended up training at the Western Australian Academy of Performing Arts, one of Australia’s best acting schools. I learnt a lot from auditioning three years in a row, and have since seen what it’s like from the other side of the table, helping out on various drama school audition panels. 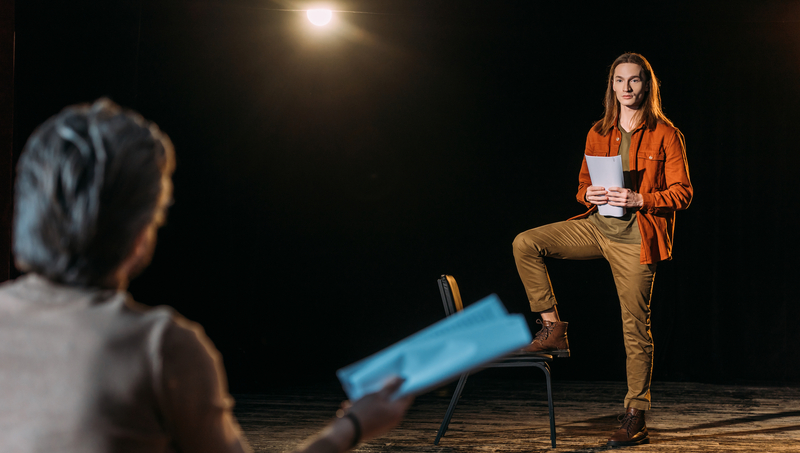 This guide on how to audition for acting school is going to help you prepare for your audition, so that you can give yourself the best chance of securing a place in an elite acting school. We are assuming for this article that you have already narrowed down the schools you are auditioning for. If you need help deciding which drama schools to audition for check out best acting schools. I know, you’re going to drama school to train, but drama schools want to see that you have some skills or at least are beginning to find some confidence as an actor. You wouldn’t audition for a top music academy or dance school without already being a very confident musician or dancer. Look for some short courses to improve your acting. You will learn something from every course you do, even if it’s terrible. The more you act, the better you get. Ask other actors what courses they recommend. I would advise finding a weekly class over an expensive one day masterclass. You aren’t looking for breakthroughs, but practical experience. Drama schools want to see that you have a strong and flexible voice. Theatre actors need to be vocally present and having a commanding voice is a sure way to impress drama school teachers. Finding a great voice teacher, or at least working on vocal exercises in the build up to the audition will increase your chances of getting in. I remember being very confused about voice coaches before drama school, I mean we’re not going to be singing are we? But your voice is a part of who you are, and it’s one of your unique tools you use in which to express yourself and your ideas. Acting and voice are interconnected, so working on your resonance, articulation and projection are as important as working on your acting. Being confident and comfortable in your body is paramount for actors. Find a movement practice that works for you. Some common practices include yoga, Feldenkrais and Alexander technique. Some of these practices can be expensive, but they are worthwhile. And once you’ve taken a few classes, you can create your own hybrid routine to do at home. Every drama school has a large movement component, so you will be doing plenty of movement work if you get into drama school. Get ahead of the game. At the end of the day what you do on the floor is what counts. If your audition is captivating then you will get a call back and possibly a place in the school. But it is still worth taking some time to make sure your application is up to speed. A. CV. Don’t lie about your experience. It’s not actually that important at this stage, so don’t fluff your resume. It is worthwhile taking some courses, doing short films and indie theatre so that you aren’t handing over a blank piece of paper, but I know actors who have secured a place in major drama schools with zero experience. B. Headshot. They aren’t expecting a professional headshot at this stage in your career. If you have them and they are natural maybe use one on your application, otherwise something simple (white or grey background) works fine. Choosing the right monologue is the most important decision you will have to make when auditioning for drama school. If you’re working with a great piece of text then your job becomes about 10x easier. Most drama schools have a recommended monologue list, but they may ask you to source your own. a. Connection. Find a monologue that resonates with you. Does it excite you? Then go with that. b. Similar age. Don’t pick a monologue that is outside your age range. It will often distract from the monologue and make it feel unnatural. c. Play to your strengths. You have around 2 minutes to impress, so play to your strengths. Choose a monologue that showcases your acting chops. Don’t show everything! But if you love comedy, pick a monologue that shows off your comedy chops. d. Variety. Typically you have to choose a couple of monologues. Aim to pick two varying pieces. They love to see versatility. Tip: don’t spend too long deciding on a monologue. I used to get stressed about finding the “perfect” monologue. Follow your gut and stick to the guidelines above. So you’ve decided on your monologue, congratulations. Picking a monologue can be really tough. Now it’s time to begin preparing your monologue. B. Acting work. Never just learn the lines. You probably don’t have an acting technique just yet, so use what you can. The most important thing to know is who you are talking to, what the relationship is, and what you want (your objective). C. Work with a teacher or director. Do at least a couple of sessions with a great acting coach. They will be invaluable. D. Don’t over think it. If you’ve done the work and learnt the lines, don’t overcook it. E. Flexibility. Make sure you rehearse the monologue in different ways and in front of other people, or a camera. One of the key things they want to see is how versatile you can be. Can you take direction? Practice taking fake direction, try it different ways – this process should be fun! Don’t take it all too seriously, if you’re rigid in your preparation then you will be rigid on the day. At some stage you will have to have a chat with the panellists. Being informed about the school is a great way to make an impression. Ask specific questions and express an honest opinion on why you want to train at the drama school. When talking with the acting teachers be yourself. Don’t try to show off. Drama school audition waiting rooms are arguably the most anxiety-fuelled places on earth. Full of young, nervous and excited actors, desperate to get a place in drama school. Be friendly and say hello, but don’t get caught up in that energy. If you need to find a place away from the crowds, do it. Do what you need to do to stay focused on the task, and don’t forget to breathe. Warm up. Make sure you do a physical and vocal warm up before the audition. As I mentioned above they want to see how you move and how open and expressive you are. If you’re warmed up, you will be a step ahead of the nervous high school grads auditioning next to you. Take some ownership walking into the room. Remember that you can always audition again and that there is no need to put a huge amount of pressure on yourself. Look at it as an opportunity to learn. If you are in an audition with other actors try to learn from their work as well. What was it about that actor that got them a recall? What did you think worked in that actors monologue? But be mindful not to get caught up comparing, you can only bring yourself into the room, and it’s not worth judging that against others. Stay open, and simply treat it as another opportunity to do what you love. And when you’re finished, don’t forget to thank yourself! What you did took guts, and you should be proud of that. Of course getting that great, top-tier acting training will be an important step in building your career, but it’s not the be all and end all. There are many other avenues to a career in acting, and it is what you make it. It may take you 3, 4 or 17 times to get into your dream acting school, and this isn’t unusual – so take the pressure off yourself.